Synposis: Thousands of years in the future, astronauts from earth crash-land on a planet ruled by apes. Anticipating that there may be others like my friend out there, I will refrain from much discussion of the film’s denouement, and focus on other aspects of this very 1960s piece of sci-fi. Planet of the Apes was a huge hit with critics and audiences when it was released, which seemed to surprise just about everyone. Although the plot sounded to reluctant studio executives like something from a cheap B-movie, they underestimated the demand for the sorts of thrills that an exciting science-fiction film could provide. For starters, it was set in outer space, which by 1968 wasn’t so outer as it once had been (the Moon landing was just a year away). People could see real astronauts on television splashing down after journeying to the heavens. How could Hollywood compete with that? The answer was to put the characters into the strangest setting imaginable: a world where apes rule and humans are mute, primitive slaves. The filmmakers bought the rights to the novel Monkey Planet by Pierre Boulle and handed it to Michael Wilson and Twilight Zone creator Rod Serling to turn into a screenplay. Looking back, it’s easy to see why Serling was attracted to the project. It’s a fantastical science-fiction adventure with a heavy dollop of social comment. It’s part Swiftian satire – Gulliver’s Travels with monkeys – and part political allegory for Vietnam and class war. It’s a cautionary tale about the atomic bomb. And the plot (and twist) would not be out of place in The Twilight Zone. You may well guess the ending long before it comes. And Wilson, who had been blacklisted and unemployable for years, wrote a trial scene which is a scathing attack on McCarthyite witch-hunts. 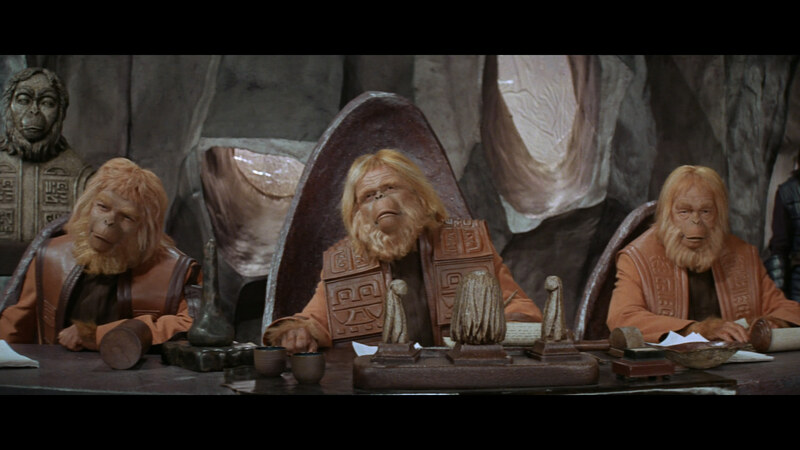 Planet of the Apes is also rather funny, corny, and very silly. Some of the dialogue is laughably bad, particularly the opening – very Serlingesque – lines delivered by Charlton Heston as Taylor, the lead astronaut: “Out here, time bends, space is boundless. It squashes a man’s ego. I feel lonely… Does man, that marvel of the universe, that glorious paradox that sent me to the stars still make war against his brother?” He does better later on when he loses his voice by being shot in the throat, gets beaten up and put in a cage, and he gives a great physical performance. By the mid-sixties Heston had inherited the iconic status of Idealised American Manhood from an ageing John Wayne. It’s too easy to dismiss him as just another square-jawed, simple-minded action man with a penchant for guns. I don’t rate Heston highly as an actor, but what he did – gritting his teeth; looking noble and high-minded; socking bad guys – he did better than most. Heston’s presence is the first indicator of the film’s curious and subversive intent. The idea of sending Moses out to the stars seems at first a no-brainer: he’ll show them who’s boss, and in fact when he first sees the half-naked, mute savages Taylor thinks he and his buddies will be running the planet within a few months. The parallel to Vietnam wasn’t lost on anyone. 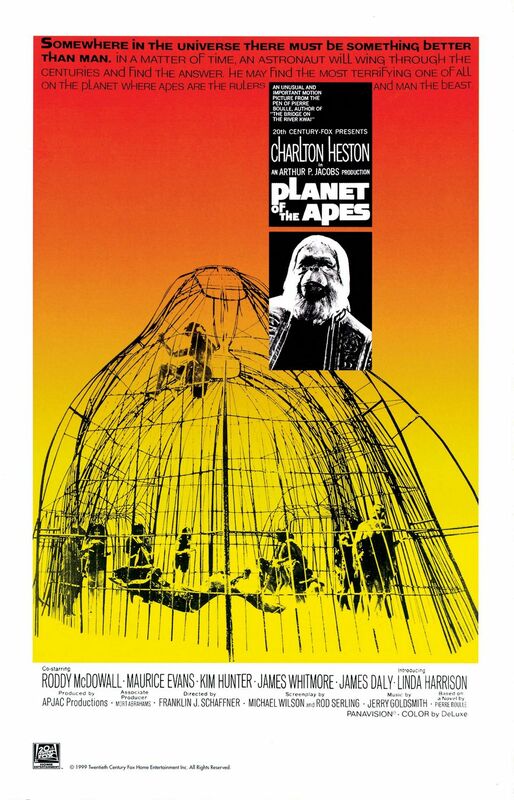 Planet of the Apes was the first of three classic, distinctly liberal-minded adventure films that the resolutely conservative Charlton Heston would make (the others are The Omega Man and Soylent Green). All three are slices of dystopian fantasy, and in all three the hero doesn’t save the day. The other sign that this wants to be more than just a silly fantasy is that the ape society is strictly divided into three groups, each resentful of the other. The orangutans are the leaders and the law-makers; the fierce gorillas are the muscle; the chimpanzees are the scientists and intellectuals. In each case the ape make-up was slightly tweaked from the real-world apes that the make-up artists studied. The gorillas, for instance, look far fiercer than real gorillas. And the orangutans look a lot whiter than real orangutans. After a few weeks on set, the crew began noticing that between shots the actors and extras would all sit together in their respective groups and not associate with the others. The iconic role of Dr. Zaius was to have been played by Edward G. Robinson, but he balked at the thought of hours in make-up and bowed out. He would have been magnificent, of course, bringing the right combination of cunning and pathos that the role requires (he and Heston did act together, though, in Soylent Green). The part was given to a respected stage actor, Maurice Evans, and it is impossible now to think of anyone else playing it. Likewise, only seasoned veterans like Roddy McDowall and Kim Hunter could have played the chimpanzees Cornelius and Zira with the requisite intelligence, warmth and … humanity. Of course, the reason why the actors playing the apes are so accomplished in the parts is because the extensive, elaborate make-up still allowed the actors to express emotion. John Chambers had a background in designing prosthetics for injured veterans. The make-up was rigorously researched and tested and cost over a million dollars (a significant chunk of the film’s budget). He was awarded a special Oscar for his work. The film was directed by Schaffner, who had done mostly television work. He was picked by Heston after directing him in The War Lord. Schaffner’s direction is uninspired but competent; his reward for making the hugely successful Planet of the Apes was to direct Patton. Linda Harrison is fairly weak as Nova, the girl that Taylor takes with him to be his Eve in the barren desert. Like Raquel Welch in One Million Years B.C, the role of Nova is another 1960s babe in fur bikini. Harrison was cast for her looks rather than anything else (she was also producer Darryl Zanuck’s girlfriend). The film originally ended with Nova carrying Taylor’s child, but the studio thought that would leave audiences asking too many questions about what the child would be like (it would also open the door to a sequel, which initially nobody wanted), so the ending was cut and we are left with that grim, classic final shot on the beach. In a just world, that would have been the end of it, but the film’s massive returns at the box office demanded sequels. Heston didn’t want to be involved, and proposed that Taylor be killed off early. Evans, Hunter and MacDowall all returned in one or all of the four rather bad films that followed, joined by the likes of Heston-lite James Franciscus, Ricardo Montalban, and John Huston. Avoid them all. The original, though, is a must-see (if only so you can get the reference to “damn dirty apes” in Austin Powers). 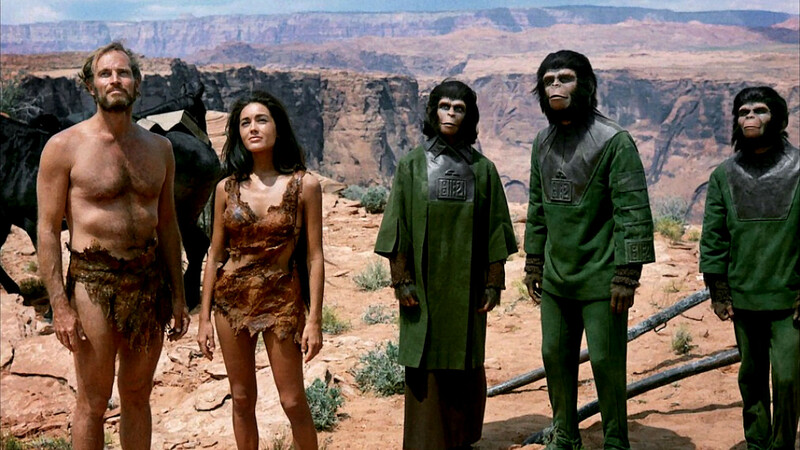 Planet of the Apes is an enjoyable slice of stinky Hollywood fromage; sometimes that’s not a bad thing. I saw this on the original release Niall, and I really had no idea about the ending. I was genuinely shocked at the ‘reveal’, and it redeemed an otherwise, let’s face it, pretty corny film. Your excellent review places it in context, and more than does it justice. i too was shocked by the ending when I first saw it as a kid. A lot of people didn’t see it coming, but a lot did. I was surprised to learn how well it was received by most critics. David Shipman calls the ending ‘sententious’, but Pauline Kael (whose critical opinions could blow with the wind) LOVED the movie. Perfect take on the film! It is corny, but this makes it such an enjoyable film. The idea of apes ruling the world make this a winner from the start. The make up was amazing for the time and gave the apes the human quality! I lived thus film as a kid and still do now. I am a fan of Heston, but I found him to be an odd choice for this film. The apes are far more believable then the humans. I will always enjoy it though!